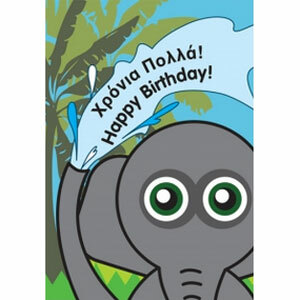 A fun, colourful "elephant" birthday card to wish the lucky recipient "Happy Birthday" in both Greek and English! Inside message reads: Have a great day! in both languages. A5 in size and complete with envelope. Our Greek - English birthday cards are perfect for a Greek-English bilingual child, or a young person learning Greek or English as a new language!